Here's my card for the sketch challenge at Catch the Bug's Holiday Chaos. I'll show you a picture of the sketch below but I turned it a quarter turn so that it worked better with the shape of my image. 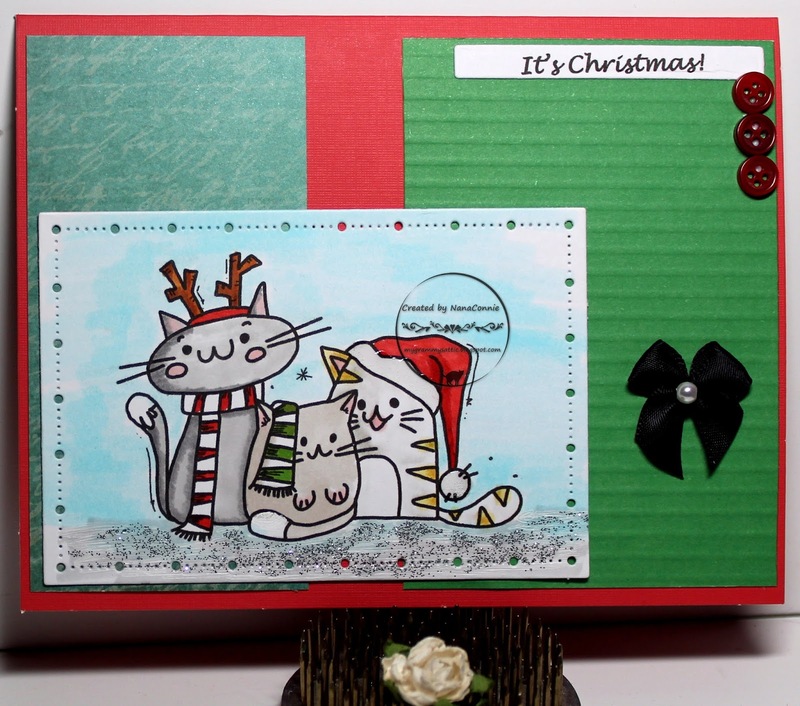 The image is from Bugaboo Stamps and I colored it with my ProMarkers, then added glitter to the snow and a touch of Glossy Accents to the white parts of the Santa hat. I cut the image with a die from Gina Marie Dies. I used a red card base, added two different papers, one with handwritten text and the other embossed with a striped folder from Sizzix. I cut the sentiment with a die from QuicKutz and added it to the embossed paper. I dug out three tiny, red, buttons and a black bow for embellishments. Adorable card! Nice design! Thanks for sharing it with us at Lil Patch of Crafty Friends! Naturally you would have cats on your card, hehe. Love the border on the image. Thanks for joining us at the Holiday Chaos 2017 Sketch Challenge, Lisa Lynn GDT. This is gorgeous and adore the kitties. Such cute kitties on your Merry Catmas card! It is adorable! Great take on the sketch and of course the cat family is delightful. Do not know if I will be able to do the full Holiday Chaos or not, but I am going to give it a try. I just think they are a hoot to do. Love your take on our Sketch! Thanks for playing along with us at Catch the Bug for our week-long Holiday Chaos! Good luck. Very cute, and a lovely take on the sketch. Thank you for entering your card into my Animal Magic challenge at CCM.